Select which account you would like the deposit credited. Payee’s signature. Payee must be listed on account. 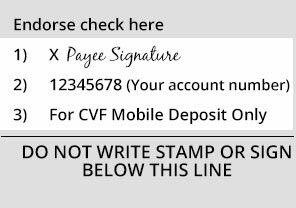 Add “For CVF Mobile Deposit Only”. Confirm the details, submit and you’re done. Be a primary account member with a $5 minimum balance. The account must be enrolled in mobile banking for at least 24-hours prior to using Mobile Deposit. Have a current and valid email address. Have logged into online banking at least once within the last year. Accounts and loans are in good standing. Deposits submitted before 4:30 PM Eastern time on a business day will be accepted as a deposit on that business day. However, we may delay the availability of those funds, in part or in total, if we need further review of the deposit. Deposits submitted after 4:30 PM or on a non-business day will be processed the next business day. However, we may delay availability if we require further review of the deposit. There is a $10,000 limit and up to 5 checks accepted using Mobile Banking per day.  What should I do with my check(s) after I’ve deposited it? After you complete your transaction, write “deposited” and the date of deposit on the face of the check. Please retain the marked check until you verify the deposit has been credited in full to your account. After that time, you may destroy it.